Our Head of School is Mr. David Hicks. For 45 years Mr. Hicks has been involved in Christian education, teaching, coaching, and leading schools in several southern states. Before he came to be a part of the Central Christian family, he most recently was headmaster of Colonial Hills Christian School in Lithia Springs, Georgia, where he served 16 years. His experience in all aspects of school administration and organization is a benefit to the staff, families, and students with whom he works. Mr. Hicks earned his Masters of Science degree in Educational Administration and Supervision from Tennessee Temple University. His undergraduate degree is a Bachelor of Arts in Music. He has many years of experience working with school choir and band programs. He also ministers as music director, worship leader, and assistant pastor at his church when God gives the opportunity. 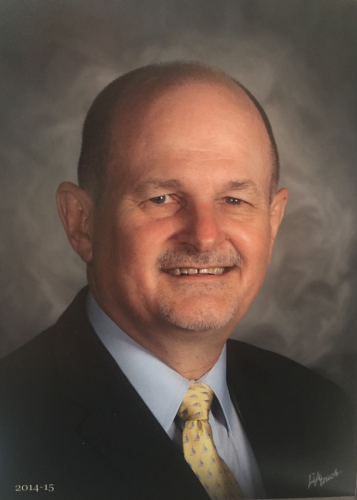 Mr. Hicks has served on multiple accreditation teams with the Association of Christian School International (ACSI), including being the Chair of the accreditation team. These teams also worked to approve schools qualifying for SACS and Advanc-Ed accreditation. He has helped as advisor/consultant to a number of Christian schools in the South. His training includes the ACSI Leadership Academy, plus Summit Ministries Worldview Conferences, both headquartered in Colorado Springs, CO, Advanc-Ed conferences in Atlanta, GA, and American Association of Christian Schools conventions in multiple states. His family includes his wife, Debbie, a recently retired English teacher, two sons, and two grandchildren. Their sons and families live in Tennessee, so trips to see the grandchildren are common. He and his wife enjoy traveling and recently set a goal to see all 50 states, after realizing they had already visited 37 (plus Canada)! His vision for our school is to honor God and to teach students at all levels to know God and to seek His will for them. A quality school can be attained with God helping families, faculty, and children. He seeks to offer Christian opportunities in course work, fine arts, athletics, and community service and missions to help our students focus on serving God now and as they prepare for their future. Welcome to our school management system – RenWeb School Management Software. RenWeb’s ParentsWeb is a private and secure portal allowing parents to see academic information specific to their children, while protecting the children’s information from others. Please click on the links below for instructions for creating your ParentsWeb account, logging in and viewing information. You must have an email address on file with CCS to create an account. Please contact pmccury@cccrusaders.com if you need to validate you email address or if you have any questions. Our business office is here to serve the financial needs of your family. Please review the information below. We welcome you to contact us with any questions you may have. All tuition payments are expected to be paid on time. Tuition is due on the first of each month beginning July 1 and ending May 1. Tuition paid after the 10th of each month will be assessed a $35.00 late charge. There are no refunds on any enrollment fees! There are no refunds on any school fees! Families who have not cleared their entire financial account by the 10th is required to contact the office immediately. Accounts falling behind 45 or more and who have not made contact with the office is subject to dismissal. Each family is required to have a RenWeb account with the school. Once your account has been activated, you will begin receiving enews/email announcements from the school office on a regular basis. The Announcements link located on the main page of the website contains information about current events happening at the school.Each family is required to have a RenWeb account with the school. Once your account has been activated, you will begin receiving enews/email announcements from the school office on a regular basis. A calendar of events is located on the main page of the website that allows you to search by date and month.Each family is required to have a RenWeb account with the school. Once your account has been activated, you will begin receiving enews/email announcements from the school office on a regular basis. If your student participates in athletics, the Sports News link is provided on the Athletics link of the website, which contains general sports news, practice schedules, game schedules, and other helpful information. How Does the School Connect With Families? Communicating with our families is a top priority for our school. We start the year off with our P.I.E Night. This required meeting is held on a Tuesday evening near the beginning of school in the main church auditorium located in building 1. This meeting is not only an informational meeting, but also a great time of fellowship with other families, worship, and prayer dedicating the school year. Our Head of School will also share the vision and plans for the year and will introduce. The school schedules an annual State of the School Address during the month of February to celebrate the accomplishments of the school year and inform families of upcoming plans and the vision for the next school year. The PTF and Administration hosts Parent Coffees during the year which allows families to join with members of the administration in informal gatherings and Q and A sessions. Dates for these events with be announced in advance of the meeting. Yes. Central adheres to a mix and match uniform policy that includes polo shirts restricted to 7 specific colors with the Central logo and khaki, black, or navy pants, shorts, skorts, or skirts, all purchased from the required school vendor. Please refer to the uniform link located on the main page of the website for other specifics. Do You Offer Before & After School Programs? Yes. Before and after school care is provided Monday thru Friday while school is in session at an additional fee. Contact the office for availability and pricing. What Are Central's Hours Of Operation? What Are The Options For Lunch? Students may bring a lunch from home or purchase catered lunches from local restaurant on Monday through Friday. Vendors include Chick-fil-A, Arby’s, KFC, Subway, Papa John’s, and Taco Bell. Please refer to the Lunch Menu link located on the main page of the website for daily specials and pricing. Can I Eat Lunch With My Kid? Yes. Parents are welcome to join their child for lunch. If you plan on dining with us, please contact the school office in advance to allow us to prepare accordingly. Can I View My Child's Grades Online? Yes. ParentsWeb allows parents to see their child’s averages as well as specific grades and assignments. Additionally, parents may view their child’s attendance, conduct history, and much more. The CCS school store is open for all students Monday through Friday each week. Students may purchase school supplies, spirit ware, tee shirts, sweat shirts, hoodies, hats, and other items. Central Christian School is located amidst the Coweta County Public School System. We abide by decisions made by Coweta County Schools regarding any school closings. We have found that if the Coweta County School System discovers that roads are dangerous to drive on throughout the county, they are dangerous for our families driving to CCS as well. For that reason, we encourage parents to listen to local radio and television stations for the Coweta County School’s decision. If they close, we close. If they delay, we delay. As a courtesy to parents and students, Central maintains a Lost and Found Department year-round. We encourage all families to write their names on the inside of all clothing, so it can be easily identifiable if any item becomes lost or misplaced during the year. Items include: school uniform pieces, spirit or sports ware, and other items that may be labeled with a name. Clothing found in the halls, lunch room, chapel, classrooms or other places will be collected and put in the Lost and Found Department. If a student is looking for a particular item, they may come to the main office to see if the item was turned in. Items are held for a period of 45 days. Any items not claimed within this period will be put in the annual Consignment Sale or donated to a local shelter. Your student’s lunch account, lunch menus, and lunch ordering are done through the RenWeb ParentsWeb Portal. Please contact the front office if you have any questions.